Dr. Jessica Emery, and the team at Sugar Fix Dental Loft started the year off right with a smile makeover that will keep this patient smiling for all of 2012, and many years to come. A long time patient of Dr. Emery's, this 32 year old female, decided it was time to treat herself to the smile she had always dreamed of. Her chief complaint was that her smile was uneven and she disliked the space between her two front teeth. 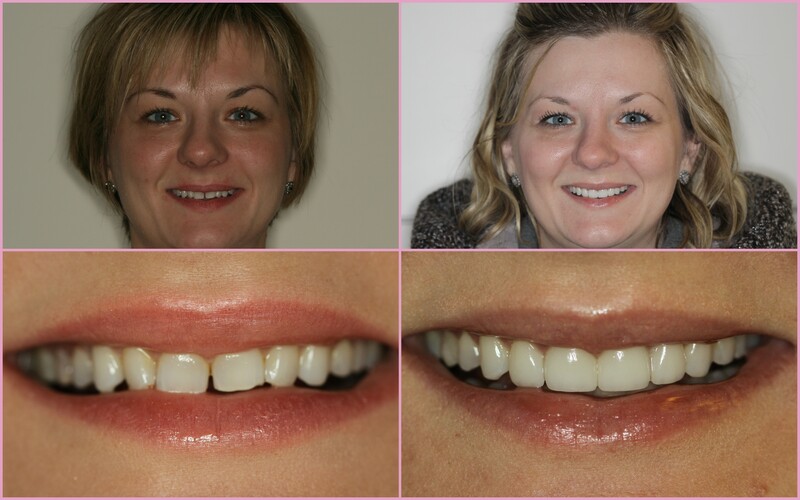 We first recommended she whiten her teeth with ZOOM II advanced power in-office whitening, and then treatment planned 8 empress porcelain veneers. The result is very natural and compliments her facial features. Most people who meet her, or perhaps know her already, would never know she has veneers. They will simply notice her gorgeous smile. It's important to Dr. Emery and her team that each and every one of our patients receives the treatment and outcome they desire when we approach a smile makeover case. Each of us play a vital role in achieving the results that make happy, confident patients. We use a second to none dental lab and work with just one technician who understands our technique and we refuse to compromise on perfection. It's incredibly important to us that our patients are as much a part of the smile design process as we are and that we deliver the best cosmetic and restorative dentistry in Chicago. We truly value the relationships we have with our patients and feel this attitude and approach is what allows us to produce outcomes like the case shown above. If you are considering a smile makeover and would like to consult with Dr. Emery , and the team at Sugar Fix Dental. Contact us today to learn more about what your options are. A new year is a wonderful time for a new and improved you!